There is a saying that a family that dines together stays together. While nobody denies the results of a good meal, not everyone takes a family meal seriously. There are some who brush it off as traditional or impractical. 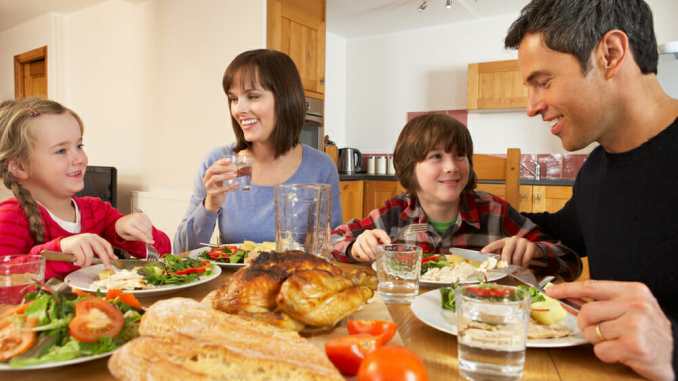 However, research in Europe, Australia and North America help to illustrate the impact and importance of family dinners. Fortunately, the meal itself isn't the important part. It could be a gourmet meal or a gluten free meal delivery. The important part is the interaction of the entire family. This has been proven to be good for the brain, body and psychological well-being. The cognitive benefits of family dinners start at a very young age. In fact, youngsters learn more vocabulary from these shared meals than they do when having a story read aloud. Researchers found that young kids learned 1,000 rare words, those that don't appear on a list of 3,000 most common words, during a shared meal. This is in contrast to 143 words learned from parents reading books to their children. Increased vocabulary is the first benefit. These benefits don't stop in younger years, however. Further research indicates that when in school, those children continue to benefit from family dinnertime. For example, shared meals is a bigger indicator of high achievement scores than time spent doing homework, in school or playing sports. Frequency also seems to be a factor as teenagers who ate meals with their families five to seven times per week were found to be twice as likely to receive A's than those who shared family meals less than two. Research has also indicated that shared family meals positively impacts an individuals health throughout their life, even after moving out. First and foremost, those kids sharing meals with their family are more likely to eat healthier by consuming fruits, vegetables and vitamins. This trend continues even after young adults move out. Those who ate family meals were more likely to eat healthy when on their own. In a society where obesity is an issue, these results are even more potent. Regular family meals have been shown to improve cognition and health. Research has even been able to demonstrate a link between these shared meals and psychological benefits. A host of studies have shown how this ritual can help in lowering a host of high risk behaviors in which teenagers may partake. One study involving 5,000 teenagers inferred that regular family dinners correlated with a lower rate of suicidal thoughts and depression. Research hasn't focused just on lowering the presence of bad behaviors, but also on the development of positive ones. For example, one study found that teenagers who have regular family meals have a more positive outlook on the future than those teenagers who didn't eat with their parents. Another study found a strong correlation between positive moods of adolescence and the frequency of family meals. A family dinner alone isn't enough to reap these benefits. It is reliant on the interpersonal relationships of the family and the willingness to talk openly about things. For many families, mealtime is the only period throughout the busy day that they can spend time with each other. As a teenager or adolescent, having time to discuss with family can help to solve some problems and make life a easier. One survey found that dinner was one of the times that American teens were most likely to talk to their parents. Family meals always sound like a good idea. The family is together, spending time and sharing a great meal. However, many people don't realize the wealth of data to back up this commonly-held belief. Family meal time does in fact contribute to several cognitive, bodily and psychological benefits. As mentioned before, the meal itself isn't as important and the time shared as a family. Ordering a pizza or cooking chicken soufflé will have little impact on these benefits.